Product prices and availability are accurate as of 2019-04-20 22:14:50 UTC and are subject to change. Any price and availability information displayed on http://www.amazon.com/ at the time of purchase will apply to the purchase of this product. Create the next butterfly hangout in your own back yard with the Toysmith Paint-A-Butterfly House. Attract all sorts of butterflies to your yard with this paint-your-own butterfly house. Your winged friends will love their new wooden home designed specifically for them. This craft set includes three paints (blue, red, and yellow) with a paint brush for your house's custom paint job. Give the gift of arts and crafts with toys that foster curiosity and encourage creative expression. Made using safe and high quality materials, this product is designed to last. Recommended for ages 5 and up. Attract all sorts of butterflies to your yard with this paint-your-own butterfly house. 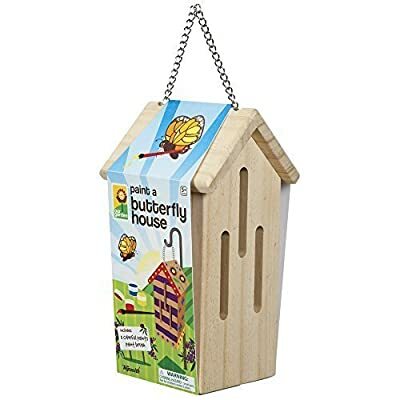 Your winged friends will love their new wooden home designed specifically for them. This craft set includes three paints (blue, red, and yellow) with a paint brush for your house's custom paint job. Give the gift of arts and crafts with toys that foster curiosity and encourage creative expression. Made using safe and high quality materials, this product is designed to last. Recommended for ages 5 and up.